People often ask about what I use when creating plein air paintings. Working on site requires essential art materials that are light and portable yet able to accomplish the task. 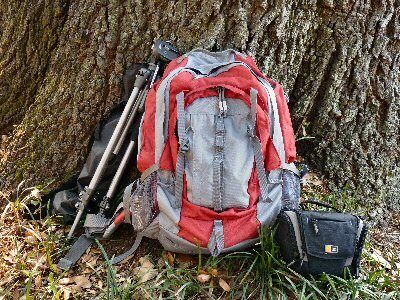 I use three kits carried in a good quality backpack for hiking to the spot. The Painting Kit, for creating plein air paintings, includes paints, medium, solvent, brushes, panels, paper towels or tissues, and of course a pochade painting box. A Drawing Kit, for making quick sketches on location, contains a small sketch book, pencils and sharpener, erasers, and pens. Also, I take along a Camera Kit, for capturing details and lighting conditions, with the camera, filters, and extra SD card all in its own case. Extras are added to the pack to make the excursion more enjoyable and productive like a tripod, water, lunch or snack, sunscreen and insect repellant. This set-up allows me to go just about anywhere I choose to find great painting locations. I’ve covered each of these kits in more detail in the Gear section. So, if you want the whole story, check it out above.